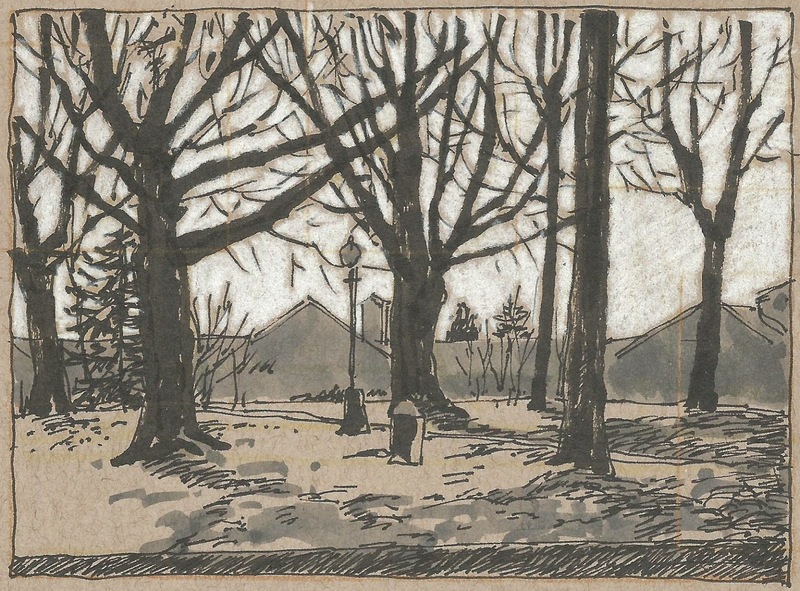 I was pleased to be asked to start contributing to the Urban Sketchers Seattle blog. Then I found myself looking for that "perfect" sketch for my first post. Um, no, I did not find it. I doubt that it exists. But here is what I drew this week. Hiawatha Park is one of the many parks in Seattle designed by the Olmstead Brothers in the early 1900's. Other than enlarging the original playfields to accommodate soccer and football, it really does not seem to have been changed much at all since it opened in 1911. I have sketched it several times in the last couple of years, and probably will again. This time, on one of our rare sunny days, I was attracted to the patterns of shadows and the bare branches against the sky.